There are many questions about the Old Orrick Cemetery. Exactly where was it? Was happened to it? Who was buried there? The Orrick family came to Warren county in the late 1820s from Kentucky. They were a branch of the Maryland Orricks who traveled south to the Carolinas then west. 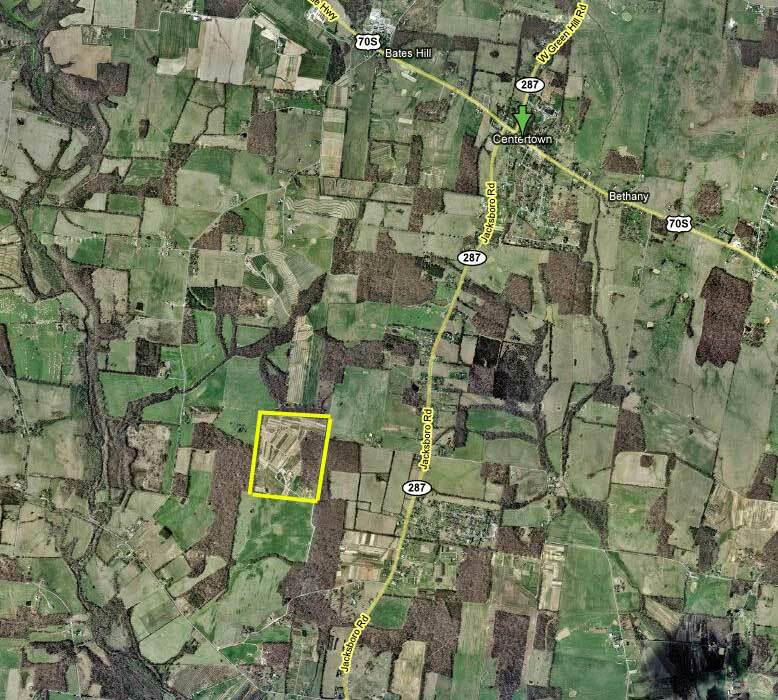 They settled and farmed this land south of Centertown until somewhere around the 1890s. Many moved away, several of the girls got married and took local names such as Whitlock and Bates, and some were killed in the civil war. While viewing various cemeteries around this area, the Orricks are noticably absent. That's because they had their own cemetery. About 4 generations of Orricks are suspected of being buried there. Lewis and Elizabeth, Allen and Martha, some of Allen's kids, and possibly some grandkids. Stories say that the Old Orrick cemetery was plowed under and pushed into a nearby well sometime around the 1940s. Another story says that headstones were taken to build a neighbor's porch. The Warren County TN Cemetery Book #4 has the cemetery listed twice, and some of the graves are also listed in other cemeteries. Publishers of this book say that they constructed the listing from stories, not by surveying it. Both of the listings are mostly in error. See below for comments from Orrick researchers and family providing interesting clues. This cemetery is also listed on page 81, with slightly less information. These listings were created from stories and are mostly in error. I believe it probably should read "..on Brewer Land". and his sister Mary Elizabeth Virgina is buried at Wilson Chapel. The 'died young' could be correct, as well as the John and the 2 James'. The following graves are found in the Old Orrick cemetery listing above. This listing is correct. 2mi N of Morrison on Jacksboro Rd. This grave is shown in the Old Orrick cemetery listing above. Page 4 - ..There was the Orrick Cemetery we went + talked to the couple that bought part of Orrick place that had the cemetery + this man said his father-in-law ask grandpa Orrick to come show him how much to fence in for the cemetery..grandpa told him he would but grandpa got sick + died + never get over to fence it in. Now when this man that talked to grandpa died then Mr Brewer that married his daughter bought it we went over + aske them about the cemetery. We couldn't wait to get there for we knew we could get Patsy's dates her husband get lot of information, oh! Me he said yes there was a cemetery + I took my slide + old mule put the rocks on the slide + put them in a well + worked over the graves. He said there were 2 or 3 rocks he had a hard time getting it on his slide so large. We ask if they had names + dates on them he said yes but I dont remember for they didn't mean a thing to me. and the big building he tore it down + used it for wood. Way he described the building it was a Church house + a well. The Orricks had a double log house, 2 story, hall between + fire place at each end + the best orchard + they were workers. He told what his father-in-law told him. A Mr Rigsby told us that this man that destroyed the cemetery before he destroyed it he came to Mr Rigsby wanted him to help do some work on his back porch. He went + this old man went to the cemetery + got a rock + put under his porch. I asked Mr Rigsby if they were writing on the rock. He said yes but he didn't pay any attention. Thought the Old Orrick cemetery was on Abe Curtis Rd. Abe Curtis died and widow sold it. Sign on road says Bush Garden nursery. Doesn't live there but maintains a nursery. 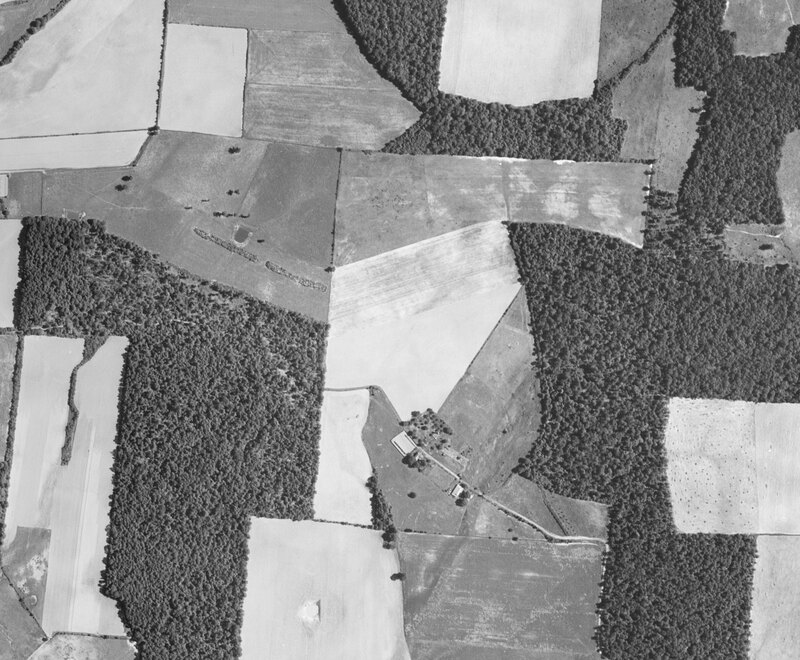 Possibly distroyed (plowed under) in 1940's according to Morris Davenport - dead now, Davenport widow possibly still alive, will ask her. 1971 headstone is probably a mistake. Property was sold to Steven and Mary Payne, then to someone else. Doesn't remember where the info came from, will look through notes. Mr Wood use to live there? In the past I did some extensive research on this ORRICK line, visited with family members and the whole nine yards, [never] found any documentation. I was told that the man that threw the headstones in a well and built a house over the location became so haunted by the memory of the ORRICKS that he had to move out of the house. He [Paris Dyer] told me a story of when he returned from the service in the middle forties, his nighbor at that time, lived on the property where the old Orrick cem. was located. Any way the nighbor lady needed her porch fixed, well her husband brought Paris some stones to put under the porch to hold it up, Paris noticed that the stones were Grave markers from the Old Orrick cem. It seems that this man had gotten permission to distroy this Cem. since it was 100 or so years old. It just made me sick to hear this, the stones have been thrown in a well and covered up, the spot where the Cem. was is now under the basement of a new house. I know where it was suppose to be. 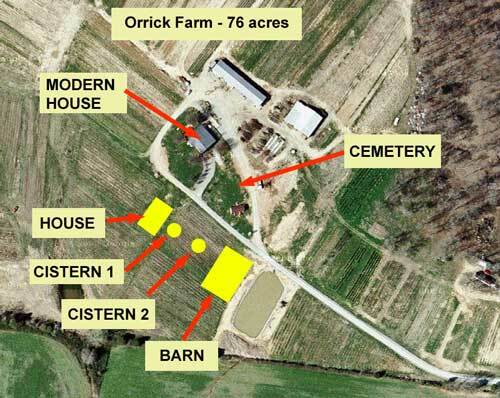 It was told over the years that a man bought the land were the Old Orrick cemetery was and later took the headstones & filled up a well with them. Then built a house on the land. It was so long ago and no family came around and by the time we were looking for it the man that did it had been dead for a long time. A Mrs. Rigsby in her 90's and good mind told me this story about 20 years ago. Her land joined it. The people that owned it when I talked to them had heard of the story but had no idea were it was at on the land. 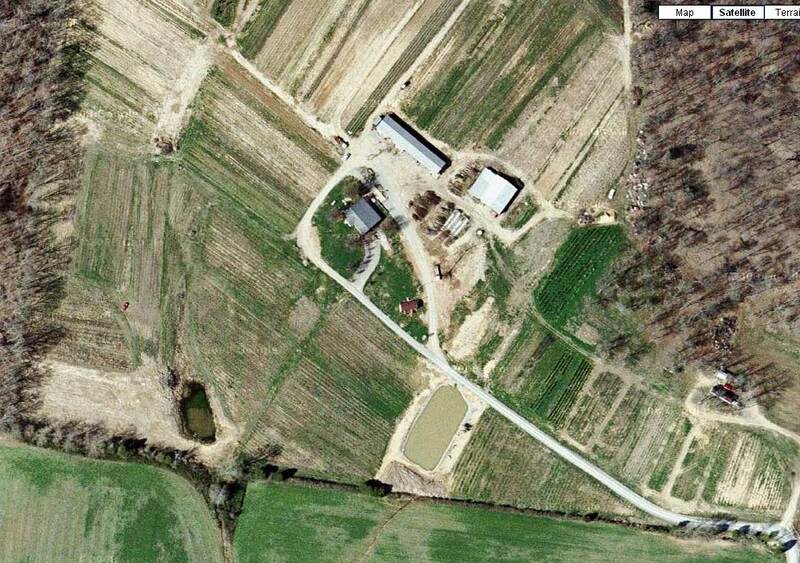 I'm not for sure but I think that road were the graves were suppose to be, was just off of Davenport Rd., on Bower's farm, that goes to a house, also a dead end. At one time it was also a road that has been done away with. You can go on Ivy Bluff Trail and run into Bertha Owen Rd. This area is between Whitlock Cem. on Bates Hill Rd. and Herman Lance Rd. As far as that private cemetery goes it was old and just rocks as headstones, etc. There were no modern burials in the late 1800's conducted there. There is a survey that shows an entry road along one border allowing access by visitors. A prior owner, after years with no visitors just disposed of what was on the surface, literally head stones (rocks). 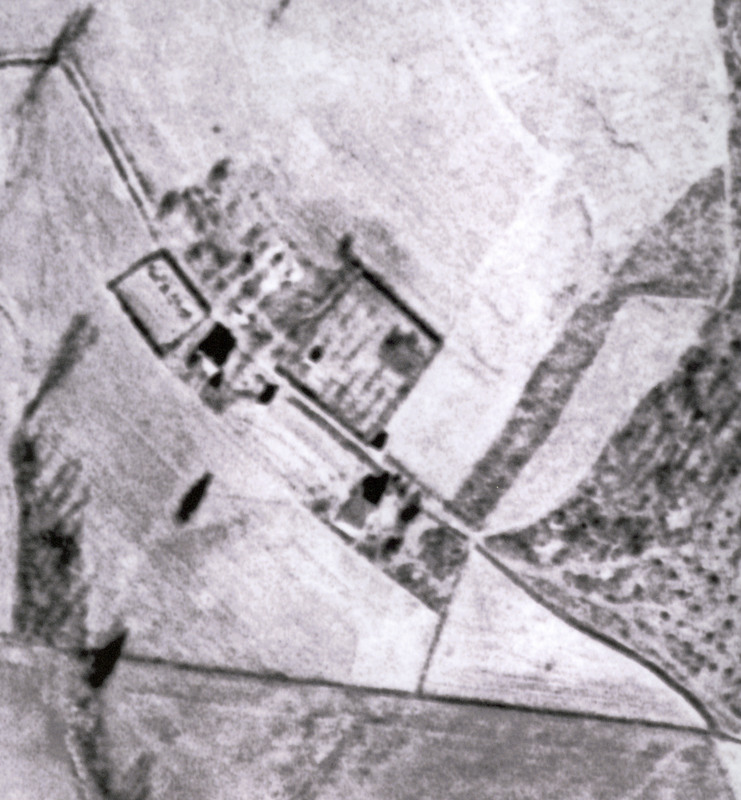 Many visits have been made to the site and nothing in the way of evidence has been recovered as to who was exactly laid to rest there. The cemetery book has evidently picked up alot of bogus information. 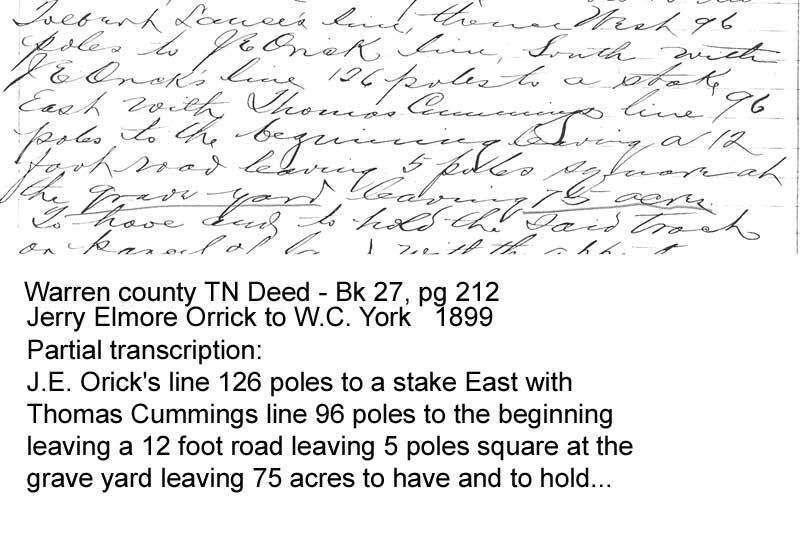 I do know that some of the Orricks were members of the Big Springs Baptist Church (from reading the church records). I've been to the cemetery beside where the church building used to be, but the only grave with markers were of Davenports that I can recall. By Martha Holt, Almetia Cunningham and Betty Majors. 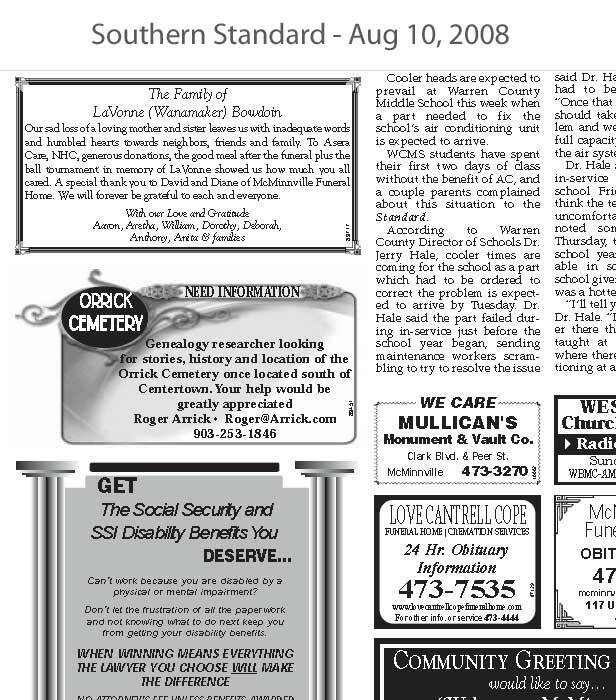 The listing for the Old Orrick Cemetery can be found in book #4.